Give Us Our Daily Bread! My wholemeal bread, in the past, has been described, at best, as being reminiscent of a house brick that no self-respecting duck would deign to self-stuff with. And, believe me when I say, I have tried making brown bread many a time without out success. White on the other hand always turns out as something that is edible and rather delicious. So why would I decide to try my hand at making sourdough? Let’s face it my track record ain’t that great. I eat a lot of sourdoughs from the various bakers across Edinburgh and it has been on my mind for several months after hearing talk on twitter about various people ‘giving it a go’, so why shouldn’t I have a bash? I was fortunate enough to snaffle 30g of Andrew Whitley’s sourdough starter stash given to Tim Keates, you know the madcap biker doing a foodie bike ride from John O’ Groats to Land’s End (if you are interested pop over to Off the Eaten Track) so without any excuses a sourdough just had to be made. With some rather cryptic instructions (see below), the starter was nurtured as best as it could be under my, *koff*, capable hands. Et voila after a week it had grown from a meagre 30g into a whopping 300g of original leaven, ready to be transformed into production leaven, which in turn would become the dough for my bread. 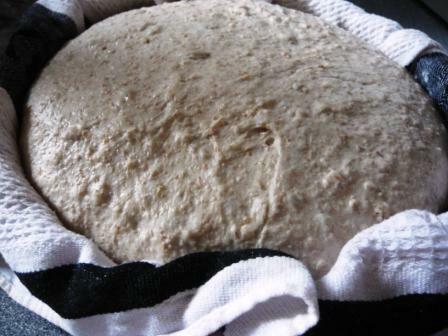 The process for making sourdough is long as the yeast used is wild, i.e. developed from the natural spores in the air and not from fresh blocks or commercially dried packets. 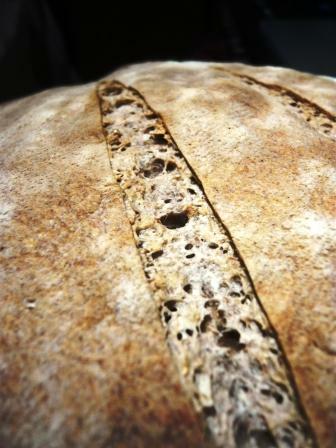 The proving time for the loaf is anything from four to twelve hours – depending on the conditions as to where it is left to slumber. 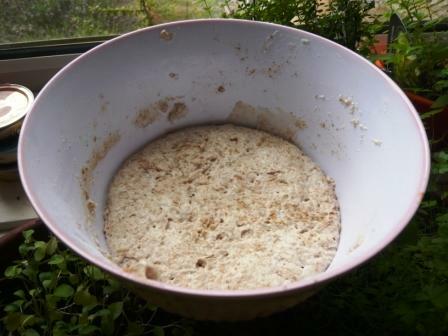 To the production leaven I tipped in the two flours, added salt and warm water. Doesn’t look pretty but it felt good mixing it with my hands. 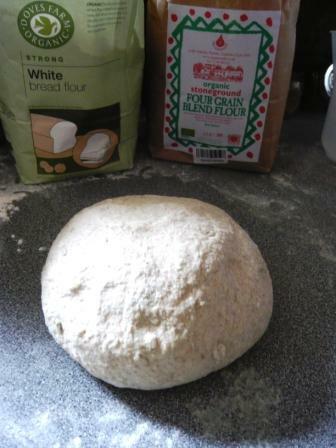 The squidgey mass I plopped onto a floured work surface and proceeded to knead briefly; it only needed 10 minutes for it to be transformed into a soft, smooth and elastic ball of dough. With my first attempt, I used a mix of half white flour and half of a stoneground four grain blend. The soft elastic lump rose in its’ tea towel lined basket really well and I was dead chuffed. Three slashes later it was ready for the oven. A quick call to Craig at Breadwinners to check as to whether I should spray water into the oven when I put the proven dough in, as well as a tray underneath with ice cubes to create steam, which helps form a good crust. Waiting for a short, sharp, slashing! My problem with this attempt was spraying water in the oven; I think I should have squirted above the dough not at it. I shocked it! The poor thing couldn’t expand; the slashes I made on the top didn’t widen as much as they should have. Hey ho, live and learn, which I did. 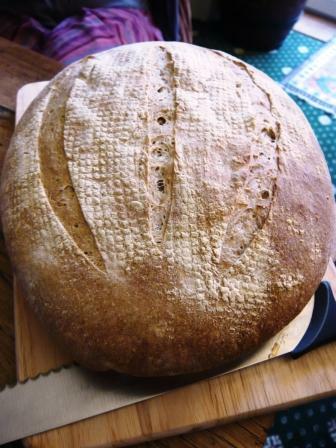 With my second endeavour, the flour percentage was as recommended in the instructions, 75/25 white/wholemeal. This rise was reluctant (even after four hours it hadn’t doubled in size) and I was getting impatient so popped it on the work surface and made use of a commodity that has been in short supply recently – the sun! And surprise, surprise, it started to grow. An hour later it had reached the top of the basket, so I tipped it gently onto a floured baking sheet, scored the top and shoved it in a hot oven, this time without giving it a shower or sauna. Reducing the temperature after ten minutes, I left my baby to bake. A rather fine looking loaf! What a delight it was when, 40 minutes later, with my kitchen filled with the smell of fresh baked bread, I flicked open the oven to reveal a very nice looking loaf. True it wasn’t an overinflated pillow but the slits had split and I was truly impressed as to how professional it looked. Maybe I was wearing rose tinted spectacles, maybe it was a good loaf, but one thing for certain was it didn’t look like a flattened beige curling stone and the ladies who came to dinner were impressed. 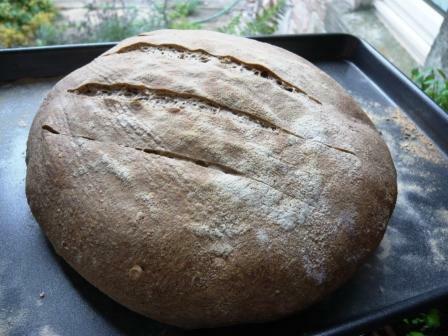 It cut beautifully, it had a great texture and crust, but above all it tasted fab – soft, chewy, slightly sour and in the immortal words of master baker, Paul Hollywood, it was a very good bake! Mix to a dough and leave in a warm place for 4 hours or a cool place for 12 hours. Then use this leaven to make your dough. 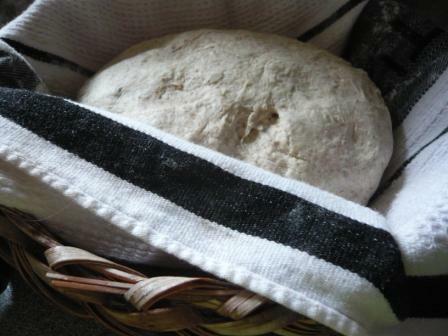 dip in flour and place in a floured banneton or a bowl lined with a floured tea-towel. Cover with a polythene bag and leave to prove in a warm place for up to 5 hours, until the dough has roughly doubled in volume. Turn out onto a baking sheet lined with silicone paper. Slash the dough with a sharp knife or razor blade to make the pattern of your choice. 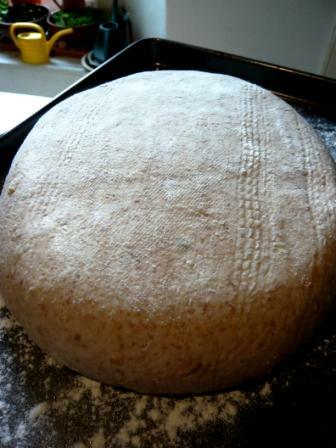 Bake in a fairly hot oven (220oC dropping to 200oC after ten minutes) to develop a good crust. 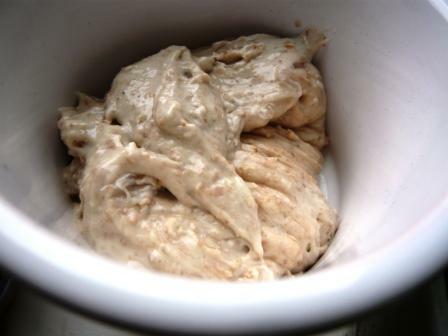 Unused leaven may be stored in the fridge for some weeks. 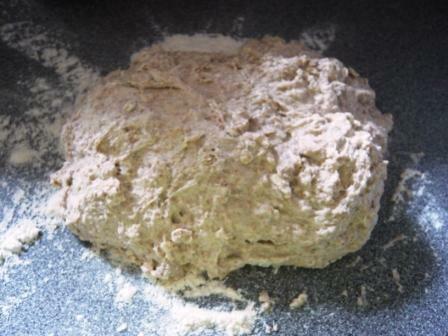 Leaven may also be frozen. 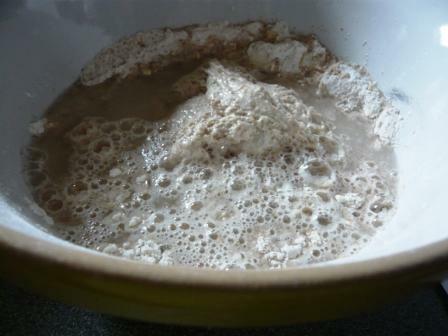 To revive it, defrost it thoroughly and do a preliminary refreshment as described in ‘Stage 1 – Refreshing the Leaven’, but take care to work out how much you will need to make bread with at the dough stage and adjust quantities back from there.